The minutes of the Library Company Board of Directors meeting of April 4, 1886, relate that “a communication was received from Mr. John A. McAllister offering to give the company a collection of illustrations and printed matter relating to the civil war, which he said cost him the labor of twenty years and more than a thousand dollars of money.” The collection McAllister subsequently bestowed on the Library Company totaled some 50,000 items–mostly printed Philadelphia ephemera, prints, and photographs–and constituted a detailed and nuanced record of social, cultural, and political life on the Philadelphia home front during the Civil War. One of the 19th century’s most extraordinary collectors, McAllister seems to have acquired mint condition copies of anything run through a printing press in Philadelphia over a period of twenty years. 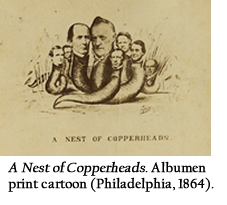 Indefatigable, he amassed political broadsides and leaflets, tickets, trade cards, cartoons, patriotic envelopes and stationery, song sheets, and recruiting posters—as well as a complement of ribbons, buttons, and other items. Learning of his interest, other collectors throughout the North supplied McAllister with material—and soldiers in the field even sent him Confederate ephemera. Our exhibition John A. McAllister’s Civil War: The Philadelphia Home Front draws on material from the collection to shed light on military recruitment; activism by African Americans; political campaigns; social life; and the great variety of civic associational activity—including the Union League, the Cooper Shop Volunteer Refreshment Saloon, and the Sanitary Commission Great Central Fair—in support of, and sometimes in opposition to, the Union cause. 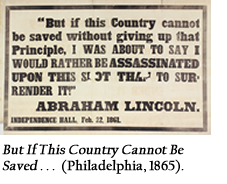 McAllister collected a variety of printed artifacts reflecting the bitter partisan spirit of the times. 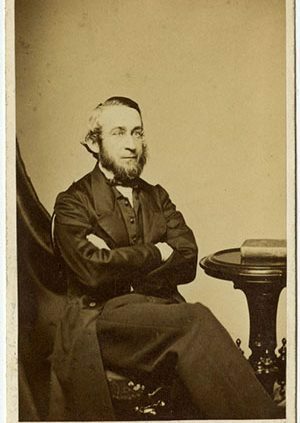 When the Republican Party held its first nominating convention in Philadelphia in 1856 it was little more than an inconsequential minority, disliked and distrusted for its abolitionist taint. 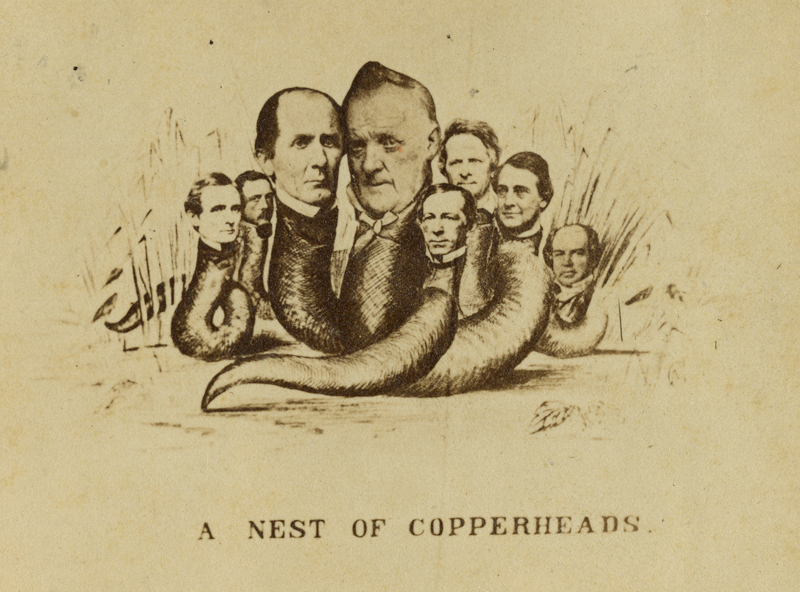 By the end of the war ten years later it was on its way to political dominance over the “copperhead” Democrats who favored accommodation with the South. The Emancipation Proclamation of January 1863 infuriated Democrats, and it also convinced Philadelphia’s African American population that it had something to gain by supporting the Union cause. Leaders such as young educator Octavius Catto and elder statesman Frederick Douglass believed that if African Americans could convince the North to arm black regiments, their valor could overcome Northern racial prejudice and lead to greater equality. 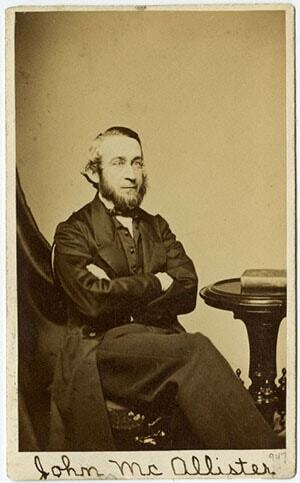 McAllister collected examples of their vigorous calls for the right to fight for the Union. Organization of the McAllister material was the work of many years. As late as 1897 a committee noted “there are 43 boxes of McAllister accumulations . . . whatever of value or note is yet to be known. It now stands as an untouched heap of combustible matter.” In 1898 the collection was assembled into dozens of large scrapbooks, which, though clumsy, served researchers during the Civil war semi-centennial and centennial years and students of Philadelphia politics and popular culture for the last century. Beginning in 2006, Library Company staff disassembled the scrapbooks, re-housed the collection, added records to the online catalog, and created finding aids, making the collection much more accessible to researchers. This work was supported by grants from the William Penn Foundation and the National Endowment for the Humanities.